Today I registered myself as self-employed. I have been self employed for a number of months, working as a personal tutor for maths and sciences in London. I have been keeping accurate records of all the hours I work in a notepad for two reasons. For my own interest to work out if my self employed status is sustainable. Because I know somewhere along the line I will need these records to placate the tax man. There are many advantages to being self employed and an option I think more people should consider. A large factor in dissuading people is taking full responsibility for their administration. I have been putting it off myself but today I sort it out. First on the HM Revenue & Customs list, this I assume this would be obvious in the vast majority of cases. For completeness here are the situations that make you self employed in the eyes of our government. Answer yes to any of these? Are you responsible for meeting any losses as well as taking any profits? Can you hire someone on your own terms to do work for you? Do you provide the main items of equipment you need to do your job? Do you agree to do a job for a fixed price regardless of how long it may take? So with my answer yes to all of these but #6 I can conclude that I definitely am self-employed. Before I can fill in a tax return I must first register as self employed. Registering for self assessment for the first time. So registering as self assessed for the first time I have to choose this option. I did not realise that I qualified as a company being a self employed individual but this seams to be the case. 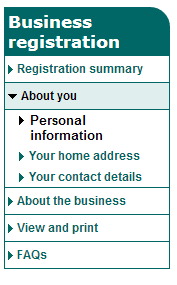 Before I can register I have to sign up for a Government Gateway account, that bit at least was easy to do. With a low income and no employees I conclude that the only one pertaining to my situation is Self Assessment. So after all of that I know get to apply. They ask for all the standard personal information. Happily much less than I thought they could ask taking only a few minutes to fill in. See image for sections. If you have lived at your address less than three years then they also request previous addresses. NOTE: These forms have terms and conditions boxes that you have to confirm you have read. Unfair as there is no option to not agree to the terms and condition of tax. So with I final declaration that I am me it is finished. In a week or so it will be processed and I will be back to the paperwork which I will also give a quick over view.